Now here is something that looks pretty boring at first sight, but comes in quite handy for different uses. It's a cube made of glass. I must confess that I - again - copied the material from a .mtl file that came along with another object that contained glass. 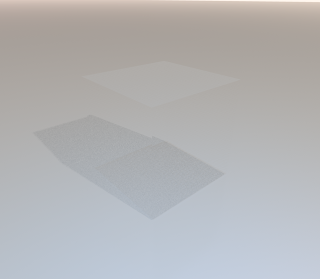 To be honest, I'm a bit unsatisfied with the material, because it is almost invisible on rendered images. That may be because it needs a little less transparency, or because the refraction might need enhancement - I don't know. Probably it would be a good idea to open it in Blender and experiment a little with the material properties. Unfortunately, I don't yet feel too confident with Blender, so I haven't tried enhancing the glass. Saying that the material was copied from some other object's .mtl may already have given you a clue how to make such a cube of glass. It's pretty much the same procedure as for all the other objects I've showed you so far. Using SweetHome3D, I created a box. Then, I exported the box to a .obj file. After that, I used a text editor to copy the material definition and altered the .obj file to use the glass material for the box. That's it! If you ever need glass, you can download it here.